This concert features two big “pibroch” tunes. This traditional Highland bagpipe style has a slow air which expands out in a series of geometrical variations, each more intense and complex than the previous. The variations generally come in pairs, one more lyrical and the next more tight and clipped, and then the air returns before the tune sets off again on the next cycle of variations. Many piping scholars think that this kind of “pibroch” music originally came to the pipes from the Gaelic harp traditions, and so this concert is part of an attempt to take it back to the harp. Maol Donn was composed by the famous piper Raghnal Mac Ailein Òig (Ranald MacDonald of Morar) in the late 17th or early 18th century. It has been a staple in the repertory of the Highland pipers ever since. It is also known as MacCrimmon’s Sweetheart, or Morar’s March. This setting of it comes from the piping of Calum Johnson of Barra, with some influences from the Gaelic singing of Kate MacDonald. The tune is meant to be a lament for a hornless brown cow, or possibly it was composed in praise of a round brown seashell which Ranald found on Camusdarach beach. The harp Simon is playing is a traditional Gaelic harp or clàrsach, of the type played in Ireland and in the Highlands of Scotland in the 18th century. It has brass wire strings which give it such a long resonance and ringing sound. 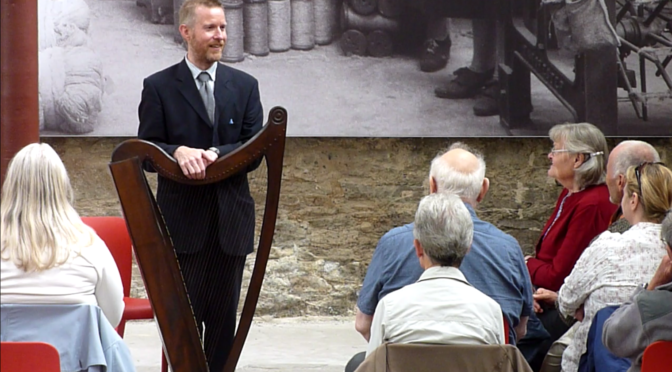 This harp was made in the West of Ireland by harpmaker Natalie Surina in 2016, copying an 18th century harp preserved in the National Museum of Ireland in Dublin.